Mondo movie effortlessly outshines the other genre themed shows presently available. But the wait times between shows kills me. I mean, where the hell is the 2012 retrospective show? In November the two wonderful hosts promised there'd be shows more regularly, but it's mid January, and starting to look like there will be another four to six month absense. I mean, come on guys. Get your arses in gear. If Mayo and Kermode can put out a 90 minute show every week, surely you could manage one every couple of months. otherwise let somebody else step in so we can have the show more regularly. The return of Mondo Movie! Hooray! This is my favorite podcast, and it is GREAT to see that they have posted again. Here's hoping for more regular updates! This was a good podcast and I still check it out but it got so irregular it got offputting. Nice guys though. LOVE this podcast. Please come back soon!! This is probably my favorite podcast. It's so refreshing to find horror/exploitation fans who are knowledgeable about the material and have intelligent commentary that is actually entertaining. Even better, they have helped me convince my husband to watch films that he would normally not consider. Their film commentaries are thorough and whatever their opinions may be, they provide well thought-out reasons to explain why they feel a particular way about a film. All this said, the podcast is still light and fun to listen to. Ben & Dan have a great rapport with each other. Hokey as it sounds, they really do seem like they are genuinely nice guys. I hope they continue for a long, long time. This has quickly become not just my favorite podcast, but a personal obsession. I thought I was an expert on trashy genre cinema, but these guys have put me to shame. If this is your thing, there's no better podcast. MONDO MOVIE is hands down one of the best podcasts for "mondo movie" fans out today. It's a fabulous look into the world of off beat cinema as well as some mainstream gems. Ben and Dan are knowledgeable and fun and have a chemistry that rolls along brilliantly. I even had the chance to meet Ben for a beer when he was in my city. Definitely worth checking out! Easily one of the greatest podcasts ever! The best, by far. Never fails to deliver engaging, witty movie talk. Plus, they're British, which means they sound smarter than they actually are. Been listening to several genre film podcasts since I got my iPhone and this one is by far the best. Not as consistant as the others but always worth the wait. Knowledgable, articulate and takes film seriously. Big Ups London! Very professional and entertaining. Half of me thinks these two are working form a script and the other half knows they can't be. Incredibly knowledgeable, they've made me go back and rent movies I've hated on first viewing just because they're so passionate. I still hated the movies but that's beside the point. It's very refreshing to get a podcast that strays from the usual "This movie is so kick-a*s, dudes" mentality. There's no other podcast out there quite like it. Kudos! This podcast is extremely entertaining. The two hosts, Ben and Dan are obviously fans of cinema, which is immediately apparent to anybody who decides to give this podcast a go. You won't regret it. This one has it all - insightful commentary and discussion on film and cinema, the occasional spontanious burst into song, and think aristrocratic English Accents! This quickly became one of my favorites. These guys love a lot of the same directors and films that I grew up loving and I usually try to rent or go see the movies they recommend. The background information they provide is often enlightening, and always look forward to a new 'cast. I only wish their output was more frequen, but that's life for you. Ben and Dan really know their stuff. They have provided me with countless recommendations, as well as insight into genre films I'd already seen. This is one of my favorite podcasts, and if you are a lover of the off-beat too, this podcast is for you. I have been listening to Ben and Dan's excellent podcast since its inception. They have introduced me to many great and unusual films that I would not have otherwise seen. If you are a fan of genre movies, you owe it to yourself to check out Mondo Movie! Awesome, awesome show, this one. I've been listening for a few years now and these two have never steered me wrong. Ben and Dan cover both older films and new releases and have brought to my attention films I never would have noticed without them more times than I can count now. They've also redirected my attention to films I have seen years ago and forgotten, or announced new editions of childhood favorites. Highly recommended for anyone interested in the genre ... worthy of listener support, so please listen and review! Nobody does it better than Ben and Dan. If you like genre films this is the one and only podcast for you. Dan and Ben are also quite easy on the ears. They have a nice banter and it doesn't just sound like 2 cats in a basement. They know their stuff and if you are like me you like podcasts with a specific target. They don't do...fluff. They cover good films and it isn't always just limited strictly to genre. 5 Stars all the way!!! Since it covers more than horror, but many of those underground or less fashionable movies that are a joy to discover. Ben and Dan are amiable hosts and be sure to add this to your subscription list! Unique podcast with excellent hosts! Mondo Movie has been one of my favorite podcasts for the last couple of years. It never fails to entertain. Ben and Dan are very well-informed, yet conversational about their topics and they try to appeal to both informed and new mondo movie converts - with great success. And honestly, they seem like great guys. That's not to say that the podcast doesn't sound professional - it sounds wonderfully clear and the content is well organized. But they are also not overly concerned with sounding like a "radio program", which is great, in my opinion. If you enjoy mondo movies, basic horror, or just like listening to movie podcats, try this one out. You won't be disappointed! Not only the best podcast out there, but probably one of the greatest reasons for the internet to be in existence. No bologna. Genius. It doesn't matter what film they are talking about the show is always interesting and funny. Ben and Dan both have love for genre films that is apperant but unlike most fanboys they can express themselves intellegently. I never miss them. The gold-standard of genre movie podcasts. Outstanding Podcast Covering Genre Film! Easily my favorite podcast. Highly recommended for fans of horror/foriegn/obscure/indie/trash/strange cinema. I consider myself fairly well versed in cinema and they have brought several gems to my attention that I had not previously heard of. Keep up the great work, guys! I've listened to pretty much all of the genre/exploitation/cult cinema podcasts out there. Mondo Movie is heads and shoulders above the rest. This UK-based podcast features well-reasoned reviews on a wide variety of films. An absolute don't-miss. Dan and Ben are always entertaining and informative. Thanks to them I have seen some of the most bizzare and disturbing movies out there. I wish it were weekly, but I'll take what I can get. Great Show with Even Better Puns! Simply put, this is my favorite movie podcast. They talk about movies that most have not seen in a way that makes you want to see them. Good Times! Ben and Dan are like your oldest friends, except they're British, obsessed with great/bizzaro movies and really well spoken. A great place to discover your new favorite movie. I like this podcast because they speak informatively and in an entertaining way about movies, some of which I might not otherwise hear about. They cover all sorts of film, with an emphasis on horror/ genre type movies. They have a real knowledge and love of film that allows them to share their opinions in a reasoned, well-thought-out way. I'm always excited when a new episode shows up on my ipod, as I have already devoured all of the old episodes. Keep it up guys! This was the first cult cinema podcast that I subscribed to. To this day, it's one of the highest quality genre podcasts going. I subscribe to approximately 20 podcasts. This is my favorite. Detailed, original, at times funny, and most of all... these guys LOVE the cinema. You won't be bored. I can't wait till the next episode. This is the best podcast for movies on iTunes!!!!! bar none. Ben and Dan really know their stuff, and you can tell they really love the movies they watch, and the podcast they make. They fully embrace genre films for what they are: pure entertainment. A must-hear. Best of the Best. Fun and Guru-tacular! In a fair and just world a listener would earn Film School College Credits just for subscribing to this podcast. Add to that the fact that Ben and Dan's work is both great fun to listen to and that they cover every genre out there. Really, if you have any interest in anything Mondo - this is the place you should start. One of the first podcasts (as far as I know anyway *Shrugs*), and definitely one of the best. You guys always are entertaining and influencial to my Netflix Queue. Keep up the great work. Hands down, the BEST genre podcast out there! First stumbled upon Mondo Movie years ago, (before I even knew what a pocast was) and it's still my favorite. Funny, intelligent and always entertaining & informative. Highly recommended for fans of cult, exploitation and just plain unusual cinema. Keep up the great work, Dan and Ben! A great podcast! Ben and Dan are cordial hosts and can express their comments articulately! If your a fan of shlocky, b-horror films, this is your show! I love Ben & Dan. It's all I listen to. My favorite. How could Mondo Movie possibly be any better? 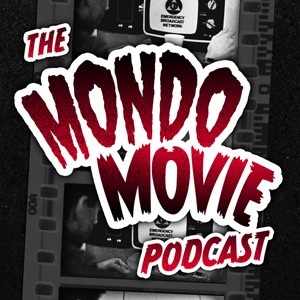 Trashy, literate, enthusiastic, thoughtful, entertaining, inspired, witty, and adventurous, "Mondo Movie" is possibly the best movie-related podcast out there. Hidden and overlooked gems of the exploitation-film genre are reviewed and savored, and I've discovered many fine movies because of this podcast. Kudos -- it could only be improved with increased frequency of shows. These guys are great critics. The show is funny, insightful, a genuine pleasure to listen to. They've turned me on to a lot of great films and filmmakers. This is a stellar podcast and they also do a really good job of cultivating a community among us fans. I can't wait for each new episode. Really great work, guys. Always unique, fun and on the edge, it doesn't get much more fufilling when it comes to Movie podcasting than this. One of the smartest casts avaliable. if your looking for a great show about cult films and other good movies check it out. Great program for those of us whose gulity pleasures involve watching movies that many people would not use for door stops. Intelligent conversation and reviews. Really cool exploration of horror, cult and exploitation films. So nice to hear smart funny and hip guys talk about the films I love. They really know what they’re talking about and are positive, enthusiastic and genuine in their geekdom. These boys clearly love these films and I my DVD shelves are exploding because of them.